String algae, horse hair, moss, and pond scum are just a few of the common terms used to describe the many different species of filamentous algae. These microscopic algal cells reproduce and link together in strands or colonies that can be seen attached to substrates below the surface of the water or as large floating mats on the surface. Filamentous algae, including Pithophora and Cladophora, are typically found in slow-moving, nutrient-rich warm water. All types of algae are important in the food web of an aquatic ecosystem. However, filamentous algae frequently take over and become problematic for all types of water resources. Excess nitrogen and phosphorus in runoff from fertilized lawns, agriculture, golf courses, or stormwater are a few of the sources that drive the problematic blooms. These unsightly filamentous algae infestations can cause fish kills by depleting the available dissolved oxygen, make any recreational activities impossible, and even harbor dangerous pathogens from runoff or animals. Implementing proactive management strategies to prevent or limit filamentous algae blooms from occurring is always recommended. Creating buffer zones around the edge of a water body reduces the amount of nitrogen and phosphorus that flows in. Regular applications of probiotics ensure a balanced aquatic ecosystem and help cycle out excess nutrients. Unfortunately, once filamentous algae blooms occur they can be difficult to control. The most common approaches to controlling filamentous algae are physical removal and chemical treatment. 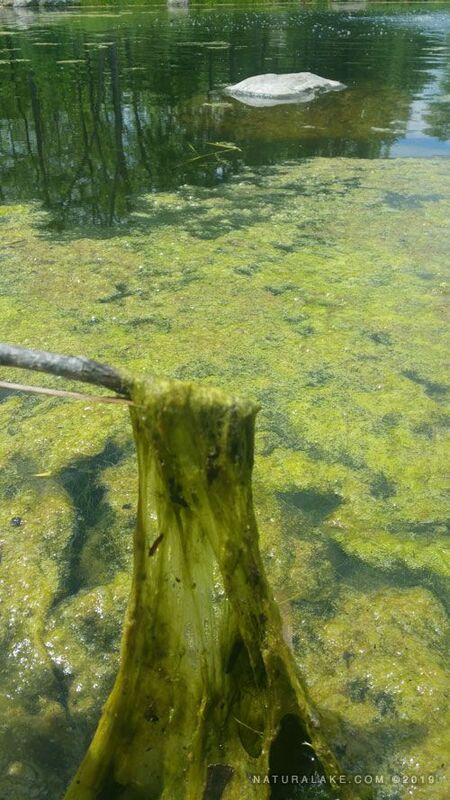 Physically removing or harvesting the algae is very labor intensive and finding a disposal site can be problematic. The effectiveness of chemically treating filamentous algae can be limited by the water’s ability to take an algaecide’s active ingredient out of solution or thick cell walls that restrict algaecide penetration and intercellular movement. Survival structures, such as akinetes, also can hinder the success of an algaecide treatment by storing key nutrients and then releasing them to promote rapid regrowth when the chemicals have dissipated. Fortunately, Naturalake Biosciences has developed a natural catalyst that advances algaecide performance. PondZilla Pro accelerates chemical treatments by improving penetration and intercellular movement. When mixed with an algaecide it speeds the breakdown of dead filamentous algal cells and weakens their cellular integrity while stimulating naturally occurring bacteria to fixate nutrients liberated during this process. PondZilla Pro ensures complete degradation of the dead algal cells and survival structures. Algaecide treatments on filamentous algae are more effective and longer lasting with PondZilla Pro.